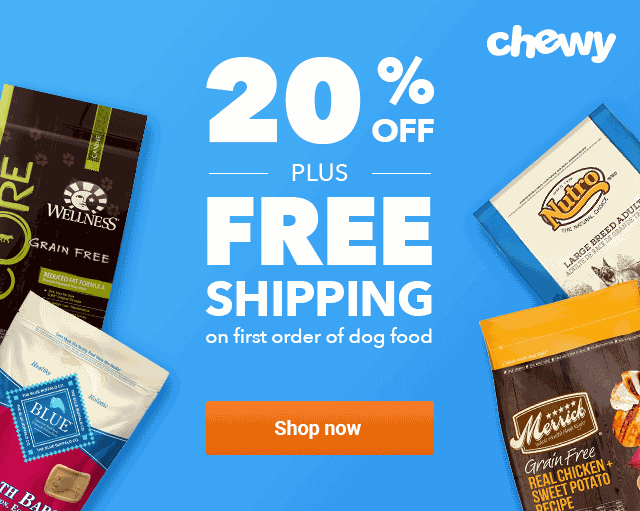 Zignature Dog Food Reviews [2019 Edition]: Top Picks & More! While you might be crazy about chipotle sauce, another person might wonder how on earth you consume that thing. It’s no different for dogs. Just like us, dogs have a penchant for specific diets and flavors. What I truly appreciate about Zignature is that they’ve done a wonderful job of providing a variety of alternative ingredients that will naturally appeal to your dog’s sophisticated palates. Zignature has also found a way to create recipes that are limited in ingredients yet tasteful and rich in nutrition value. Therefore, never mind that your dog is not the sensitive type because she will still love the taste and enjoy the nutrition benefits that every Zignature dog food pack has to offer. 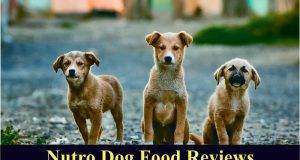 Later in this article, I’ll be looking at Zignature dog food reviews so as to provide you insight as to how different, diverse, and beneficial their recipes really are. But in the meantime, it would be great if you learned a thing or two about the Zignature brand and what makes it special. 2 What Makes Zignature Recipes Special? Zignature was founded in 2010 and is owned by Pets Global Inc. Despite being a relatively new brand in the luxury dog food space, Zignature has made a name for themselves in the industry, competing toe-to-toe with other established brands. This is mostly because of their approach to dog food formulations. Part of their excellence in dog food quality is due to the fact their ingredients are majorly sourced in the US from trusted farmers. Also, all their formulation processes are done in the US from their kitchens in South Dakota and Minnesota. I also admire their commitment to quality and the constant endeavor to present your dog with premium dog food at an affordable price. Proof that their manufacturing standards are high is their stellar record of compliance with the Association of American Feed Control Officials (AAFCO). Recalls are, to an extent, a good measure of the safety standards of a given pet food brand. In the case of Zignature, you will be pleased to know that Zignature dog food recall history stands at zero to date. You might argue that they are still a young brand. While this is true, it does not negate the high-quality and safety standard that they have showcased so far. It’s clearly a brand that you can trust. What Makes Zignature Recipes Special? Zignature’s recipes depart from using common staple ingredients that can be a source of allergies and other diet-related physiological discomforts. Such ingredients include artificial preservatives, artificial flavors and colors, corn, chicken or any chicken products, wheat or soy, potatoes, and so on. Some pooches are fine with some bit of grain in their diets as well as chicken. But equally true is the fact that there are are a good number of dogs that may be allergic to such ingredients. Zignature takes care of that by providing a variety of hypo-allergenic foods that match the special needs of your mutt. The first ingredient in all Zignature Recipes is quality animal protein. Expect to see a wide range of them, from deboned turkey, lamb, and salmon to duck and novelty meats such as kangaroo. Ingredients are sourced from trusted farmers in the US as well as countries such as France, New Zealand, and Australia. A key selling point for Zignature is the immense dog food recipes they boast of. As a doggie parent, you have the option to choose from 13 premium kibbled recipes as well as 13 canned options, providing you with a selection of 26 premium, limited ingredients Zignature dog foods to work with. What also sets this brand apart is the fact that all their dog food recipes have a low-glycemic index. Low-glycemic dog food implies that recipes comprise complex carbohydrates whose rate of sugar absorption into the bloodstream is low, thus preventing sugar spikes in the blood glucose level. 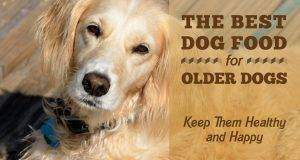 If you have a diabetic dog, she will not only find them helpful to their health but also tasty. 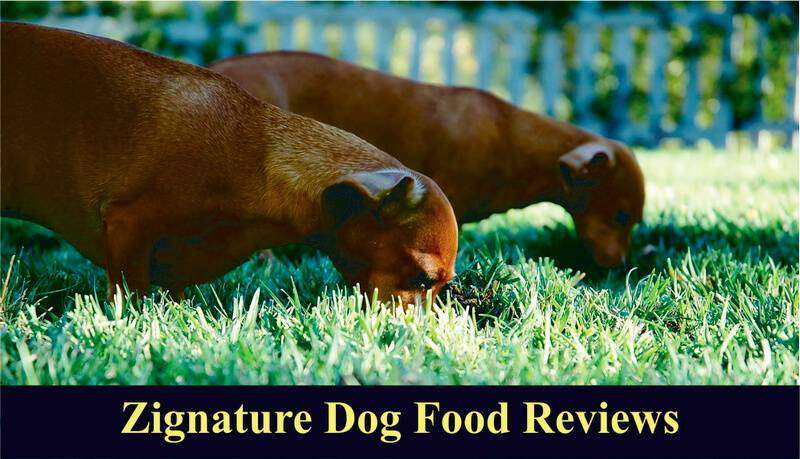 The case for Zignature dog food recipes is easy to make because the quality speaks volumes and is reinforced by the many positive Zignature dog food reviews from the consumers who continue to shop for them. Although this dog food falls under the luxury dog food category, Zignature has done well on slashing the price to more affordable rates. 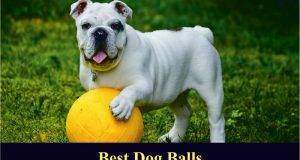 Chewy.com is one of the leading online pet stores that you can be sure to find Zignature products at the best prices. As promised earlier, here’s what I was able to round up as the best Zignature dog foods. 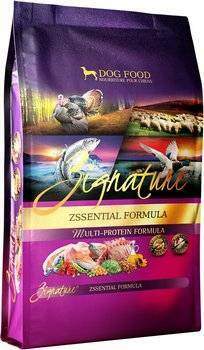 Zignature Zssentials Dog Food is one of the brand’s best sellers. Your pup is assured of healthy, lean muscle growth and optimal mass derived from turkey and salmon. The low-glycemic carbs in the recipe, such as peas and chickpeas, provide the energy that fuels your pup’s active lifestyle. If your pooch is adversely affected by diets containing chicken (and its by-products), potatoes, corn, wheat, or soy, then you might find Zignature Zssentials Dog Food ideal for her condition because it’s free from such ingredients. A shiny coat and healthy skin on your canine buddy is an indicator of good health. You are bound to notice just that within a month of using this recipe because it boasts a rich omega-fatty acid profile from ingredients such as salmon and flaxseed. To make it complete and balanced, Zignature added an effective blend of antioxidants rich in vitamin B12 and minerals such as selenium, riboflavin, and phosphorus to promote your mutt’s immune system. You can order your Zssential Multi-Protein Formula Grain-Free formula anytime from trusted suppliers like chewy.com. For dogs that do not react well to grains and potatoes, Zignature Kangaroo offers a premium alternative with no saturated fats at all. This recipe is considered one of the best and healthiest meals from Zignature partly due to the use of kangaroo, an exotic protein they source from Australia. 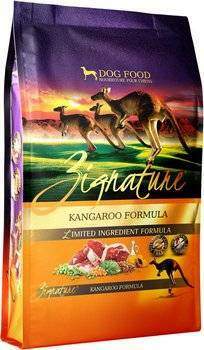 Given that kangaroo is the first ingredient in this recipe, your pooch will benefit not only from adequate muscle growth but also from the fact that it contains almost double the amount of vitamin B12 when compared to any other meat. In addition to that, the recipe is enriched with essential omega-3 fatty acids to promote a smooth coat and healthy skin. There’s also a powerful blend of antioxidants rich in vitamins and minerals to boost the immune system of your dog. Low-glycemic carbs in the recipe provide the much-needed energy and dietary fiber, resulting in better digestion and mitigation of the rate at which glucose is absorbed into your pooch’s bloodstream. Generally, when your pup loses interest in every other recipe out there, your last resort might just be a taste of kangaroo. She will most likely take to it. Chewy.com remains one of the best stores you can place your order for this recipe. Is your dog one of those whose taste buds have a love affair with anything fishy? 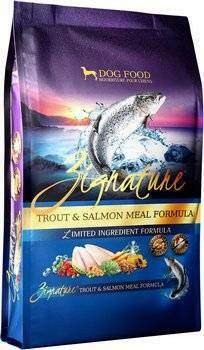 If so, this salmon and trout formula will rock your canine pal’s world. 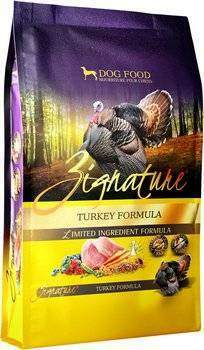 She can expect not just tasty food but also lean muscle growth and optimal weight from this dog food formulation. The protein is further reinforced by the presence of salmon meal and flaxseed which are also laden with omega-3 fatty acids for healthy skin and coat. The dehydrated alfalfa meal in the recipe offers plenty of fiber and digestibility while the peas and chickpeas contribute to low fat and energy provision. Your pup or adult buddy is also likely to love the taste as well as benefits from the antioxidant blend of rich vitamins and minerals that promote a stronger immune system for overall better health. If you’d love to get your dog some, Zignature Trout & Salmon formula is available at chewy.com. Zignature Turkey Limited Ingredient Grain-Free formula is made from only one protein source and a handful of other quality ingredients. If your pooch needs a simple uncomplicated recipe complete with all the essential nutrients, Zignature Turkey is a good pick. The first ingredient in this recipe is turkey, which most dogs find tasty. 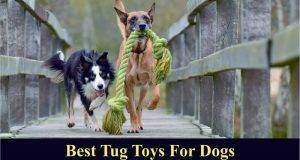 Besides, it does a good job of developing the muscles for both pups and adult dogs. Other than being a protein source, turkey also comes loaded with other vital benefits such as being low in saturated fat thereby promoting a healthy heart. It also serves as a reliable source of phosphorus and selenium. Phosphorus is essential in bringing rigidity to the shape and structure of your dog’s bones while the latter helps in strengthening the immune system. In case you are worried about common allergies, you can rest easy knowing this hypoallergenic recipe is absolutely grain, chicken, and potato free. These carbs have been replaced by legumes such as peas and chickpeas which have a lower rate of being absorbed into the bloodstream. 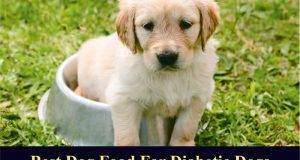 This is especially beneficial if your dog suffers from diabetes. Nevertheless, all dogs will still enjoy the taste plus premium health benefits from the nutrient-rich content available in the recipe. Orders yours today from chewy.com while supplies last. 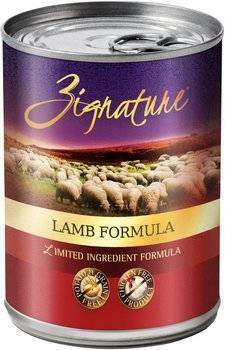 Whether you have a sensitive pooch or your pup just loves the taste of lamb in a wet recipe, consider this particular formula an ideal choice. Because it’s a hypoallergenic formulation, your allergy-prone dog is bound to gain a lot from it. Zignature Lamb Limited Ingredient Formula Grain-Free Canned Dog Food makes use of a single source protein, pasture-raised lamb, which is not only great for muscle development in both adult dogs and pups, but also a viable and tasty nutritious option for dogs that are sensitive to other animal protein sources like chicken. Like the other formulas, this recipe boasts of peas and chickpeas, both being low-glycemic complex carbs rich in energy and helpful in maintaining appropriate glucose levels in the blood. Also, the addition of antioxidants and a full spectrum of vitamins contributes towards promoting a strong immune system. As mentioned earlier, Zignature’s lineup of canned dog food options includes up to 13 healthy recipes. 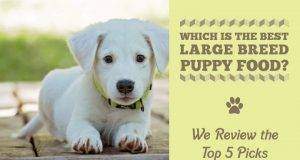 Should your pup dislike this recipe, there’s still a few more you can try, all of which are available at chewy.com. What I’ve found so compelling about Zignature is the fact that all their dog food formulas are rich in quality ingredients, tasty, and full of health benefits. Isn’t that what every pet parent wants in a dog diet? What’s more, just about every Zignature recipe in this list boasts of a low-glycemic index, limited ingredients, quality animal protein(s), and they are all grain-free. So, any diet that you opt for will definitely fit your normal dog and even the one with special dietary needs arising from conditions such as diabetes, weight loss, and sensitive stomachs. Let’s face it, nowadays, it’s not that easy to find affordable premium dog brands that tick all the boxes across their entire range. That’s why Zignature’s dog recipes stand a head taller than the competition.